I figured it was only appropriate that the header for this month comes from one of my images that appeared in the recent issue of Taproot magazine. Untitled 371 is one of several pieces in my "Miniature 24" series. Just as the series name implies, all were created in my "mini tank" which measures 5" x 7" (final piece sizes are 4" x 6"). Since I normally marble in a 20" x 25" tank, there was a lot of adjusting going on, to say the least. It was an adventure in patience, discovery, steady hands, and determination. I was truly surprised at how much you can do in a small tank that you can't do in a large tank. And I was just as surprised that I couldn't do things in the small tank that I could do in the big tank. It took my marbling to a whole new level. The piece above was such fun to create. I've played around with concentric circles in my larger tank in the past but in the mini one, you not only get many more circles in, you have greater ability to control how tight (or not tight) they are. As a result, I think you can create a more dramatic sense of movement ~ which I find totally exhilarating. I have to admit, when I first saw this piece blown up to fill an 8.5"x11" page, I was a little astounded. It seemed so, well, LARGE. 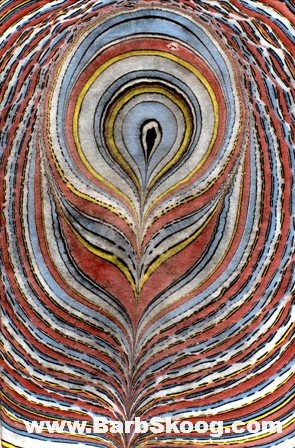 But it also allowed me to see new images in the piece ~ new ways to interpret the pattern and patterns. I've always been a big fan of using scale as a tool during the creative process ~ but it never occurred to me to use it AFTER the process as well. What a game changer. My mind is already racing with new ideas.